With the advent of fiber optic cables starting in the 1980’s, the majority (one estimate says 99%) of this country’s overseas communications are carried by undersea cables. These are interesting system constructions, being first redundant and second, self healing. Glass fiber stands themselves are fairly fragile. Bundling several together then sinking them in the ocean can create mixed results. Deep ocean bottoms are often very rugged, containing mountains, canyons and fault lines. Thus the submarine cables used have to be pretty rugged. There is a common misconception that fiber optic cables do not need repeaters. That is not true, while they do not need as many repeaters as copper cable, repeaters are still required approximately every 40-90 miles (70-150 km) depending on the cable type. These active devices are another failure point. Overall, it is a complex system. It weights about 7 pounds per foot, which is pretty hefty. This shows a new cable called the “Emerald Express” which is going into service in 2013. Throughput is reported as 60 Tbps, which is moving right along. As noted on the map, this is more of a schematic diagram connecting two shore side points. The path the cable takes is an estimate and the actual geographical location may (is likely to) be different. Click on any line on the map for cable information. 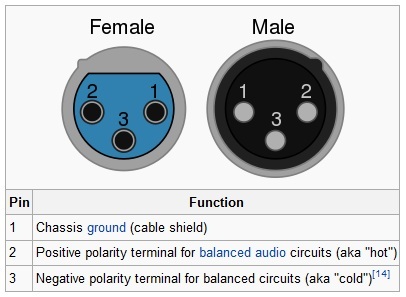 Most cables have their own web page and Wikipedia article. Approximately 231 ms round trip route from NYC to LA to Guam and back, which is over 8,000 miles (12,850 km). A few of the intermediate routers did not answer and I tried this several different times; the same routers time out. This missing information looks to be small steps, not large ones. 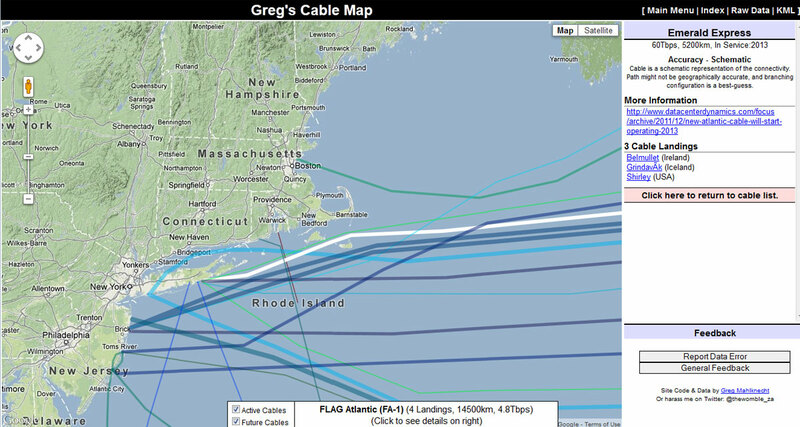 So, which cable goes directly from LA to Guam? 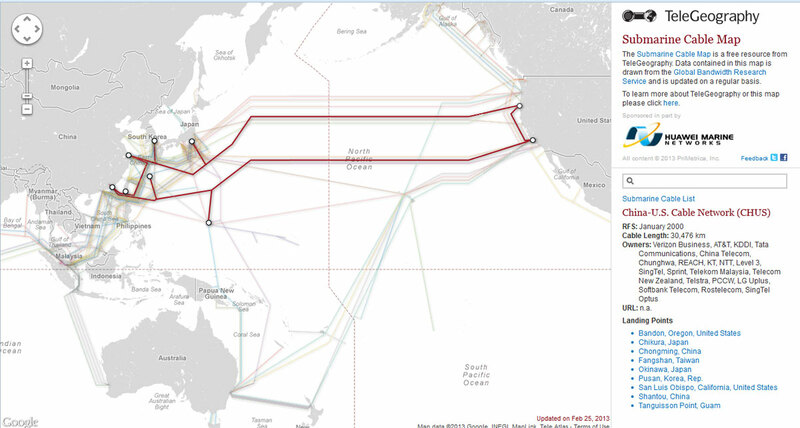 Possibly the China-US Cable Network (CHUS) (picture above). 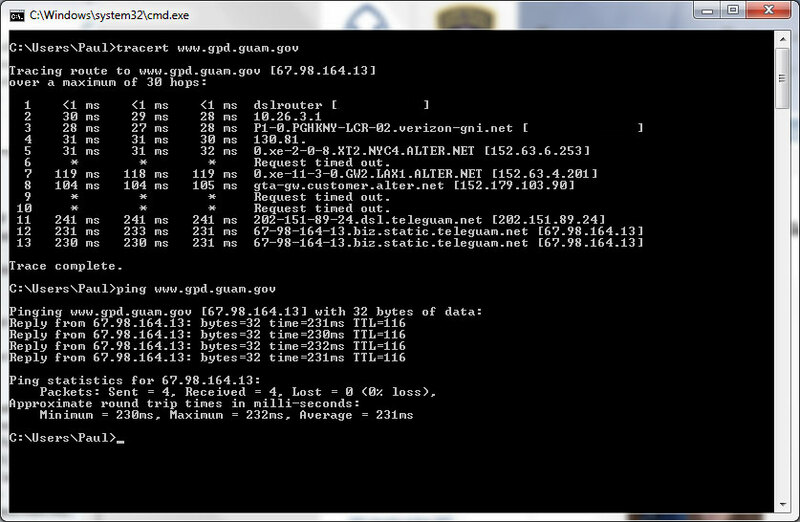 At 2.2 Tbps and landing at San Luis Obispo, that is the likely candidate for the cable that carried my data. As a general exercise, it is kind of fun, although it may be harder to figure out a particular route to say London or Berlin because there are many more different possibilities. Route latency is something to keep in mind when planing out AOIP connections for remotes and other interactive type connections between studio and remote location. Almost nothing is worse than that half second delay when trying to take phone calls or banter back and forth with the traffic reporter. 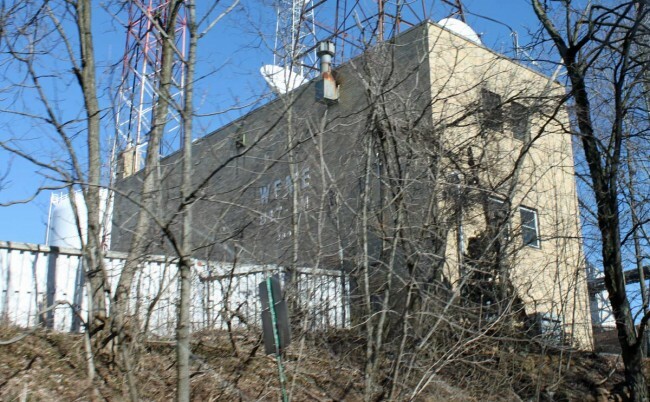 That is the main antenna for WNSH, 94.7 MHz Newark, NJ, aka “Nash-FM.” Below that is the backup antenna for WEPN-FM (98.7 MHz), WQHT (97.1 MHz) and WFAN-FM (101.9 MHz). More on those stations later. I believe WFME is still originating its programming here, now being broadcast on WFME 106.3 MHz, Mount Kisco. I had to use the facilities there, the interior is like a way back 80’s time machine, which is kind of cool. 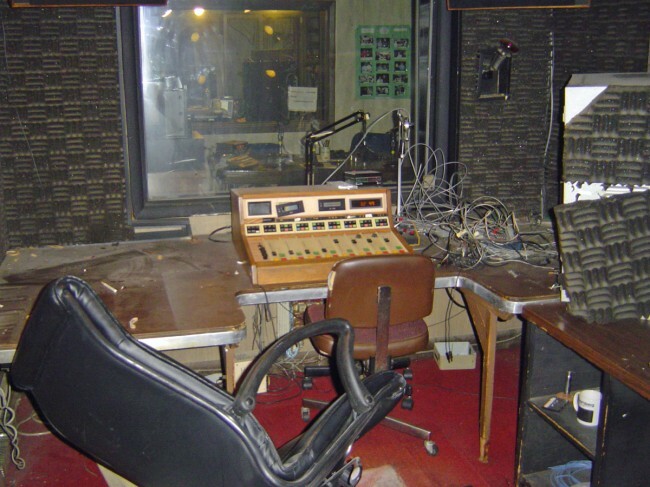 If I owned a radio station, I would go for the 70’s office decor; dark wood paneling, shag carpets, bright blue bathroom tile and avocado green appliances, but hey, that’s just me. 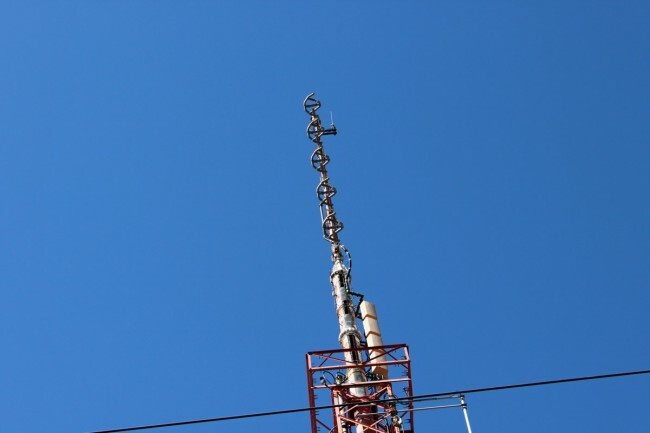 This is the WNSH backup antenna, mounted on top of a UHF slot antenna for WFME-TV. There is an LP TV antenna mounted there also, but I don’ t know who it belongs to. 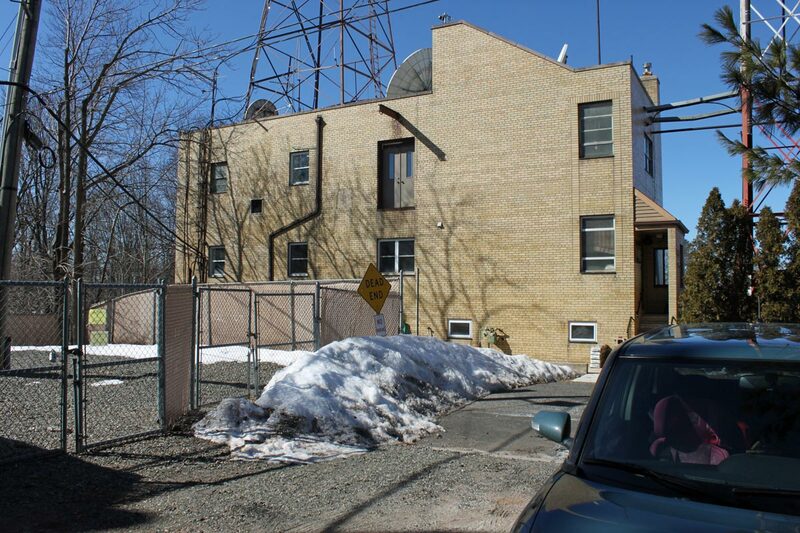 Overall, it is an interesting transmitter site on “First Mountain” in West Orange, NJ. Also located here, WFMU-FM, an old ATT microwave site, now owned by American Tower and several cell carriers. In other words, it is just like most other mountain top transmitter sites, except there is a shopping plaza across the street. Being from upstate NY, I get it. Perhaps the Manhattan salary man will too. There are no DJ’s on air quite yet, just music, some commercials and a few “Nash-FM” liners that sound slightly distorted. Two reasons for this; first, I am deep into the IP networking curriculum and time is at a premium. That being said, I am rather enjoying myself in school, which is always good. Secondly, and related to the first part, I have not been spending too much time these days doing Broadcast Engineering work. Thus, the subject matter and various topics have not been jumping out at me as they normally do. On the LPFM front, the FCC has dismissed over 3,000 translator applications from the great translator invasion of 2003. This is great news and now potential LPFM applicants can use the FCC LPFM search tool to get a good idea of what is available in their neck of the woods. Other search tools include Recnet and Prometheus Radio project. Filing window is October 15, 2013, apply now or forever hold your peace. Chris Imlay has some good ideas on AM revitalization. His suggestion is to have the FCC enforce and strengthen its existing rules regarding electrical interference. I notice two letters are missing from his list, those would be “h” and “d.” While the ideas are technically sound, it seems unlikely that the FCC can or would be able to enforce stricter Part 18 rules. Lots of EAS shenanigans going on with zombie alerts and hijacked EAS systems. Really people, default passwords? Secure your equipment and networks or pay the price for complacency. Nearly all new equipment has some sort of web interface, which can be a great time saver. They can also be easily exploited if left vulnerable. Fortunately, this was not as bad as it could have been. Something happened in NYC that hasn’t happened in quite a while. Country music filled the air on a station that is generally receivable in the five boroughs. This may not seem like big news to the rest of the country, but in market number one, it is big news. Further, Cumulus has registered “NashFMxxxx.com” for every FM dial position. National country channel in the works? I’d bet yes. A look at recent trends shows that Cumulus is standardizing formats on many of its AM and FM stations, making them, effectively, part of a nation network of over the air repeaters. Clear Channel has put more effort into iHeartradio, for seemly many of the same reasons as Cumulus’s standardized formats. Where is this all going? There are several trends evident including; AM will eventually be declared DOA and switched off, transition to national based music formats, an emphasis on IP (internet) based delivery systems, an eventual phase out of local programming, smaller staffs concentrated on local sales and little else. 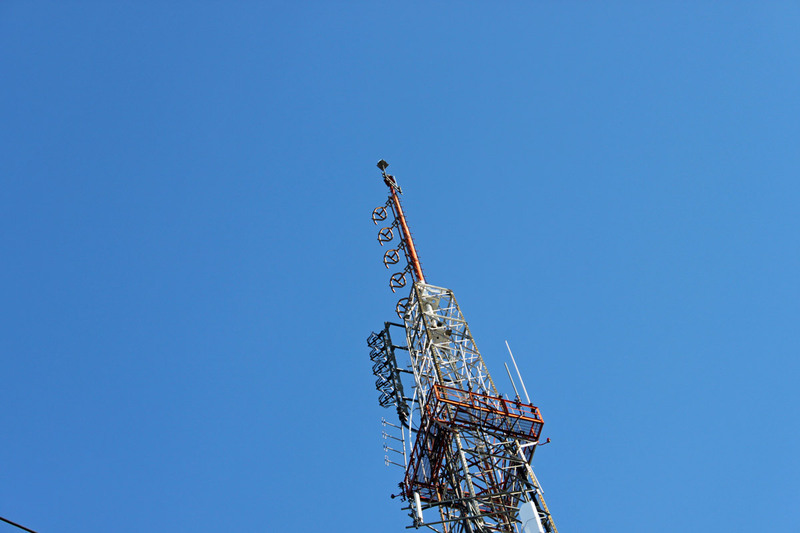 The single bright spot could be LPFM. Only time will tell if this new crop of LPFM licensees will keep the faith and tradition of local radio. If one looks at the natural course of evolution, under times of extreme stress, species tend to get physically smaller in response. The larger species cannot sustain themselves with the necessary energy intake and die off. See also: Dinosaurs. I certainly would call this prolonged, nearly dead economy stressful on the broadcasting business. Perhaps, when all is said and done, it will be the small, volunteer LPFM still on the air and serving the community. This is from several years ago. We rebuilt the WBPM studio using a reconditioned AudioArts R-60 console. WBPM is licensed to Saugerties (Saw-ger-tees), NY, however the studio is located in Fishkill, NY some 50 miles away. As such, the air signal is not listenable at the studio and off air monitoring is done via the T-1 STL line. I am sure that this is what the FCC had in mind when they wrote the Main Studio rules. The studio is a fairly small setup, but functional. It is located with co-owed Pamal stations WSPK and WHUD. 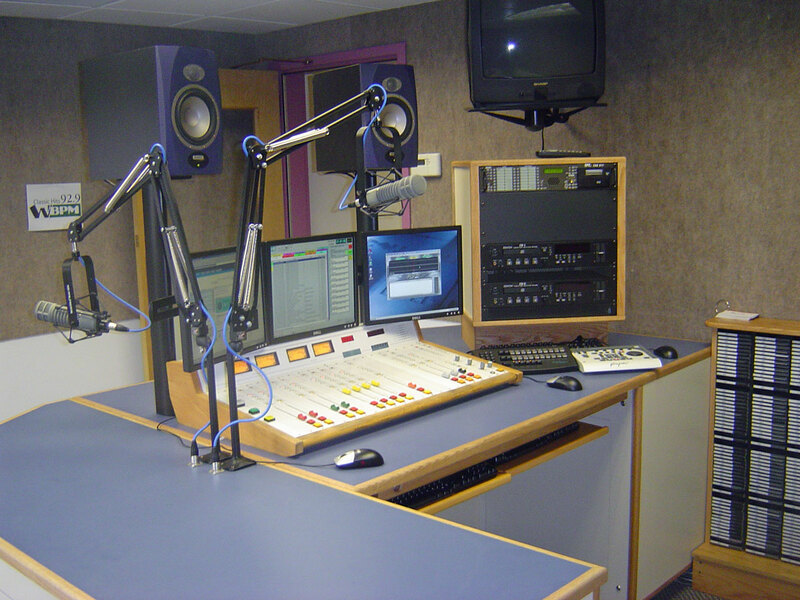 FM and AM broadcast radio processing has gone through many iterations. At first, the main processing function was to limit the input audio to a transmitter and prevent over modulation. This was a particular problem with early tube type AM transmitters, where over modulation could create power supply overloads and kill the carrier while engineers scrambled around resetting things and hopefully pressing various buttons to get the transmitter back on the air. Over the years, processors incorporated not just limiting, but compression, gating, equalization, clipping and so on all in an effort to keep ahead or at least abreast of the station across town. Today, broadcast air chain processors come in all shapes and flavors. In addition to that, internet streaming stations have their own unique set of issues to deal with. The top of the line Telos Omina or Orban Optomod systems are great, however, they can set one back a pretty large sum of money. Enter then, the Stereo Tool PC based software processing program. The first difference between, say the Omina and Stereo Tool is the end user decides the hardware and basic operating system. The second difference is Stereo Tool comes with a free trial. Then there is the price difference, which ranges from about $48.00 US for the basic version, to $161.00 US for the basic FM version and finally $269.00 US for the full version (actual prices are in Euros, which will fluctuate day to day and the credit card company will likely charge an exchange fee). Add to that a medium speed (2 Ghz) Intel Pentium4 or better computer, 1 Gb or more of RAM, good sound card and it all comes out to a reasonably priced audio processor. Much more info at the Stereo Tool website. 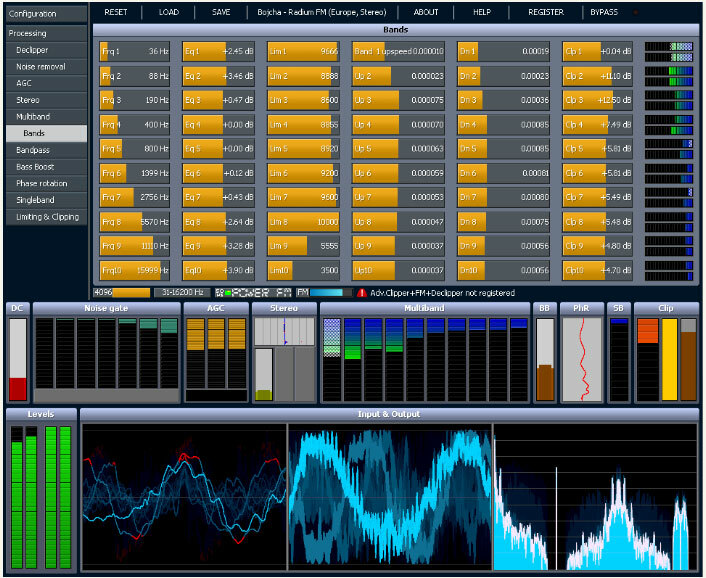 PT: What prompted you to write audio processing software? HvZ: Since I was very little I’ve always wanted to have my own radio station. I remember playing with walkie-talkies and trying to receive their sound on a real radio when I was about 8 or 9. I never really did anything with it until I found out in 2001 that you could easily start a webradio station – I actually found out because I was listening to a pirate station in my car which turned out to have a stream; within a week my own station was online. Of course I needed a bit of processing for it, and I wrote some command line tools – a singleband compressor, a stereo to mono convertor that didn’t cause any loss of audio (I was broadcasting hard trance on a mono 56 kbit/s stream, and this was the only way to get a decent sound out of it), and some time later a multiband compressor. In 2004 I left the company I worked for (ASML, they make machines to make computer chips, customers are companies like Intel, AMD etc.) to start working for Philips Healthcare, where I was going to work on image processing for X-Ray systems. I had 2 months of ‘spare time’ between those jobs, and I wanted to learn to program in Visual C++, so I decided to a GUI around my command line tools, and make a Winamp plugin out of it. I called it ‘Radio Tool’. I never really planned to do anything with it, it was just an exercise project. About a year later I came across the Winamp site again and I saw that you could upload plugins. So I uploaded my program, now renamed to ‘Stereo Tool’ because a Google search for “Radio Tool” gave far too many hits. Within a week there were over 1000 downloads and a while later it surpassed 90,000. At that point I decided to create a new version, Stereo Tool 2.0. For quite a while this remained a hobby project, I occasionally worked on it for a few months and then I wouldn’t look at it for months. But at some point I was approached by someone people who worked at a “real” (FM) Dutch radio stations who asked for some extra features – he couldn’t get the audio loud enough, and that’s how I got into clipping. Things started to get better, I learned more and more about processing, the number of downloads increased and people became more and more enthusiastic about it. At some point, after reading something about how an FM stereo signal looks, I thought it might be possible to output a stereo signal with a 192 kHz sound card, so I bought one and did some tests and it worked that same night, and within a few weeks I added RDS. PT: Do you know, approximately, how many stations (AM/FM/internet) Stereo Tool is being used on? HvZ: FM: About 500, ranging from small community and pirate stations up to large nation-wide stations which run Stereo Tool at a dozen transmitter sites. Streaming: Not sure, but definitely over 1,000, probably a lot more. PT: I have read through the forums on your site, Stereo Tool looks like a very complete processing system. Any plans for new features, future upgrades, etc? HvZ: Yes. I’m currently working on a new multiband compressor. The multiband compressor in Stereo Tool is still based on the code that I wrote in 2001 for my webradio station, which in turn was based on an even older version that I had used on 8-bit audio. It also has far too many bands. Because of this, the multiband compressor is currently the weak spot of Stereo Tool. In the last weeks I have made a new singleband compressor that sound a lot better, it actually outperforms other compressors I have tested, and I expect great results for the new multiband compressor, which will also have less bands. Something else that I’ve been planning for a long time is a composite clipper, which will add 1-2 dB of extra loudness and especially better highs. Stereo Tool can already be louder with good audio quality than nearly any hardware box on the market (see for example this video, Radio 538 uses an Orban 8600 http://www.youtube.com/watch?v=4VpfcqUPQys – unfortunately due to the mpeg compression it’s a bit difficult to compare but listen for distortion ) – but there’s always room for improvement. PT: What are the advantages of a PC software based processor vs. a hardware based (e.g. Omni or Optomod)? Also, Stereo Tool contains a stereo and RDS coder, most other processors don’t, so instead of having a whole bunch of devices everything can be done in a single PC, which also results in a better quality. Recently I added a new feature that enables synchronizing multiple FM transmitter signals that all connect to a simple Shoutcast stream (video: http://www.youtube.com/watch?v=GYQ5CYs0ZX8 ), so you also don’t need any streaming hardware anymore. Of course there’s the price. A hardware box that gives “similar” quality (of course every processor sounds different, and it’s a matter of taste, so it’s difficult to compare, but I’m assuming that things like low volume levels, gain riding, distortion and lack of clarity in the highs are bad) easily costs $10,000 or more. And you can always easily upgrade to new versions. If you already have a PC with enough spare processing power you don’t need to buy anything. 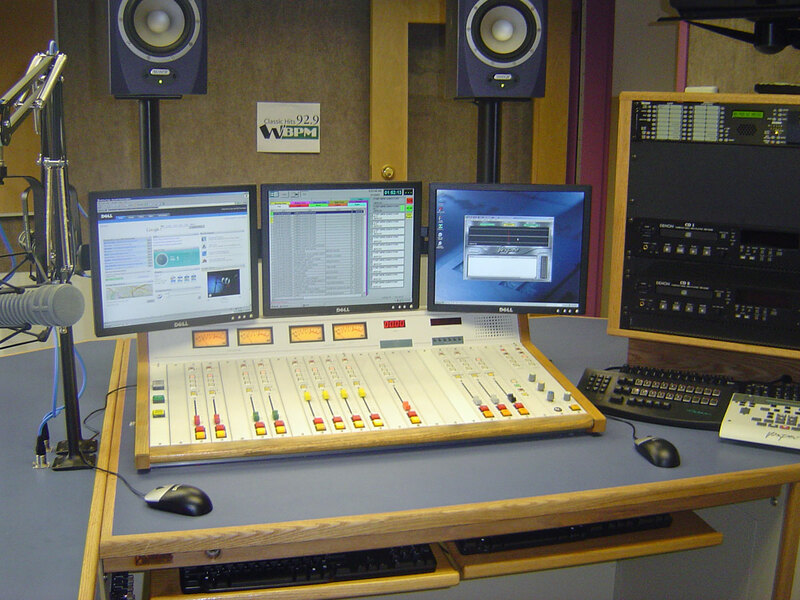 I know that some people at radio stations are ‘afraid’ of using a PC in their processing path, but based on feedback I get from the stations that run my software it’s completely stable – and of course if a PC does break, you can replace it with any fast enough PC you have lying around – you just need to put the proper sound card in. But for development, the advantages are huge. If you use DSP’s, it’s usually a lot of work to even make a very small change. When I worked at Philips Healthcare, the image processing that had been done – without much changes – on DSP’s for many years was being converted to PC’s because of speed of development and price of hardware. Once the conversion was finished, the development speed increased dramatically and 2 years later the image quality had improved beyond anything that was imaginable with DSP’s. PC’s get faster every year, and you don’t have to do anything for that – for the same price the processing power that you can buy roughly doubles every 1.5 years, and if you pay more you can get even more. If you use DSP’s, you have to do a lot of work yourself, you cannot just ‘buy a faster DSP’. Testing things is very easy, I can write some code that does something new, post it on my forum and I’ll have feedback from users the next morning – with DSP’s that’s a LOT more difficult and it takes a lot more time. I’ve learned by now that everyone hears things in a different way, and occasionally there are groups of people who hear something they find very annoying while many other people (often including myself) don’t hear anything wrong with it at all. Especially in cases like this it’s really great to be able to quickly send new versions to several people all around the world for testing. PT: Are there any particular sound cards that work better with Stereo Tool? HvZ: Yes. For the best results, use the Marian Trace Alpha, with the ESI Juli@ as second-best choice (it needs calibration). Thank you very much, Hans, for the interesting insight. Checkout the videos, especially the declipper video, which is quite amazing. That will cleanup all but the most ham handed DJ mistakes. PC based audio processing software is a great solution stations on a limited budget that cannot afford high end air chain processors. 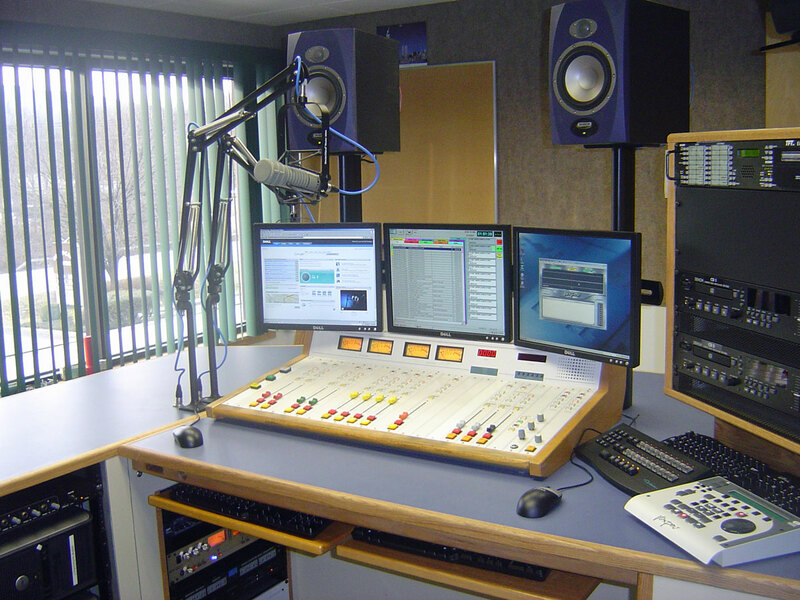 There are many LPFM’s, Part 15 stations and others that can get great sounding audio and RDS for a very reasonable price. Currently, the AM settings do not allow asymmetrical modulation, which is more of a US thing. There is some talk of adding it in a later update. 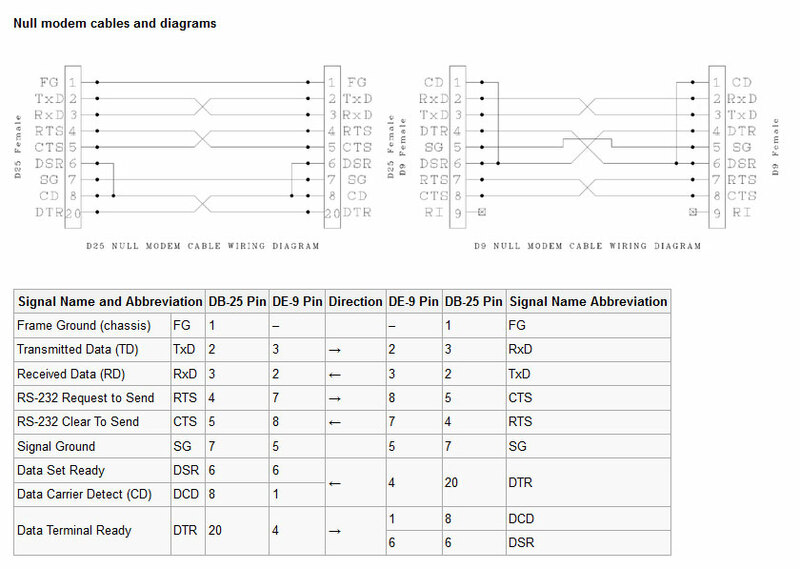 Over the years, I have collected many pinouts for all sorts of interfaces, connectors, jacks, etc. These are all stored on my laptop and in my smartphone. It is easy enough to look these things up online, however, there are occasions when the internet is not available for whatever reason. Thus, this is my collection of pinouts, many of which have been adapted from wikipedia articles. Many times I put things here for my own use. However, if I have spent ten minutes looking for the USB pin out on my smart phone, someone else has done the same thing. Most all of these images have higher resolutions available. Standard networking connectors for Ethernet connections. Rumor has it that only the “A” standard is accepted for government work and the “B” standard is being depreciated. 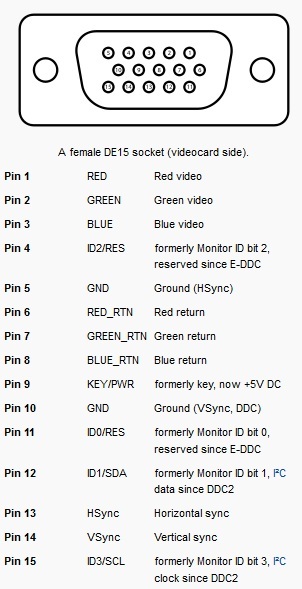 Power over Ethernet pinouts. More and more commonly used in VOIP phone systems, but can also be found in wireless access points and other things of that nature. Ethernet crossover cables are useful for connecting to similar pieces of equipment together, e.g. a computer to a computer, or a switch to a switch. 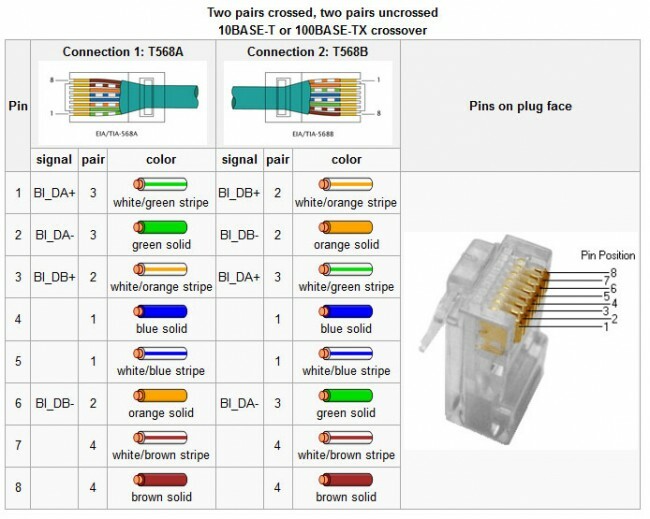 Many new switches have port sensing, which will automatically cross the connection if a straight through cable is used. Others have a specific port or a switch for a specific port which will cross over the cable. 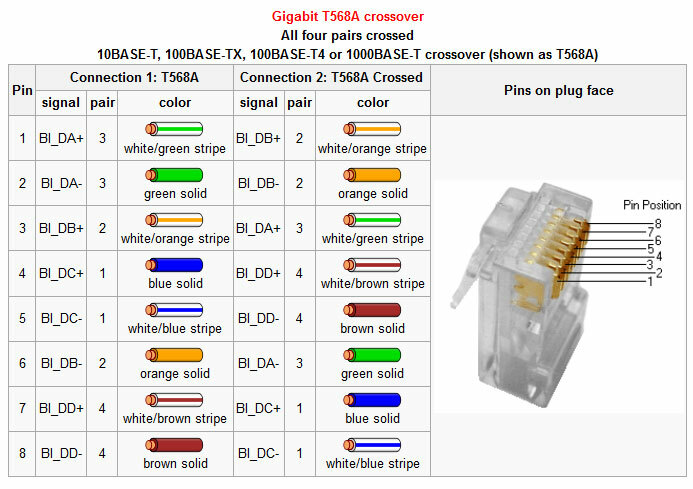 Gigabit Ethernet uses all four pairs, thus a 1000 base T crossover looks a little bit different. This type cable is backwards compatible with 10/100 base T systems. RJ48 and 48X used on T-1 (DS-1) and ISDN connections. 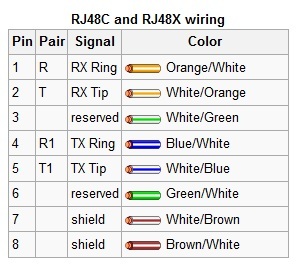 Since BRI and PRI ISDN are two wire circuits, the active pins are 4/5, which is the same as an RJ11. I have often used RJ11 jacks for ISDN and found no issues with doing so. 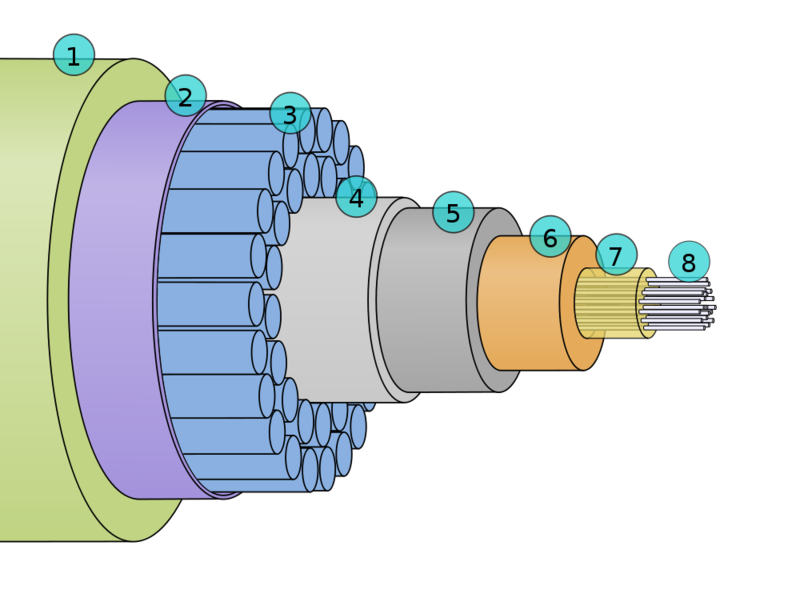 Crossover cable for T-1 (DS-1 or DSX-1 interface). Note, this is different from an Ethernet crossover cable, which will not work for in a DS-1 interface. 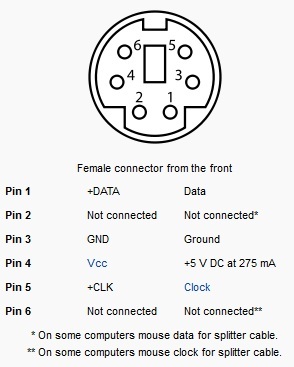 A T-1 loopback connector goes from pin 1 to pin 4 and pin 2 to pin 5 on a 8P8C connector. 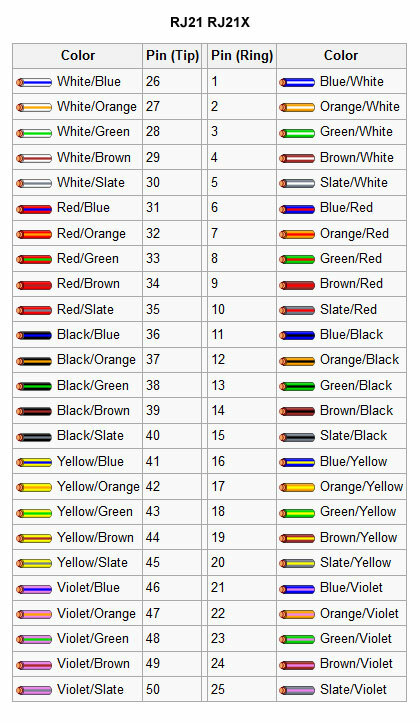 RJ21 and 21X color code. 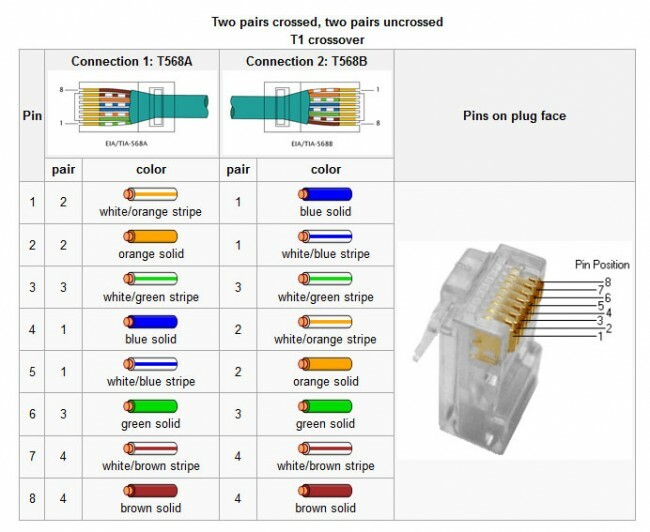 RJ21 and 21X connectors are often found on the side of punch blocks and make for quick connections on cabling trunks. 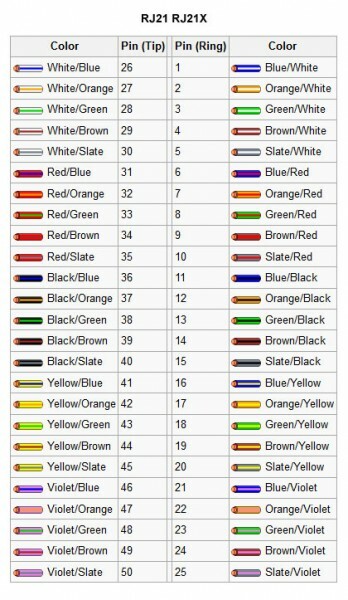 The generic 25 pair color code, which is always a good thing to have. RS-232 is still commonly used for data transfer in broadcast facilities. 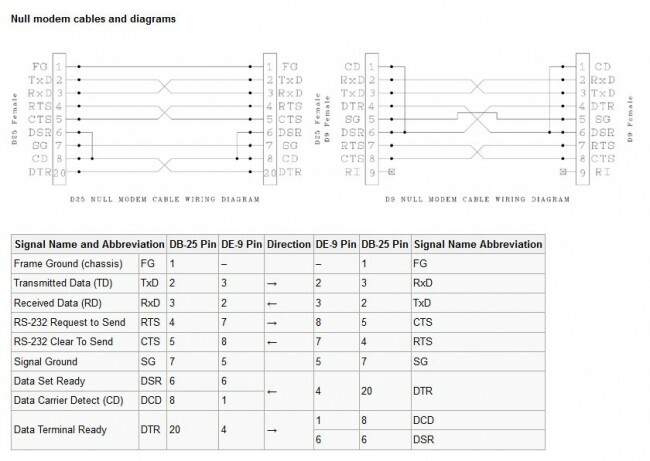 RS-485 is also used, however, that standard is often used with screw terminals or some other generic connection. Null modems for connecting equipment together and testing. Various USB connectors and pinouts. USB has replaced RS-232 data ports on most newer computers. Computer parallel port pinout, not used very much anymore, replace by mostly USB devices. Can also be used as a limited GPI/GPO interface. 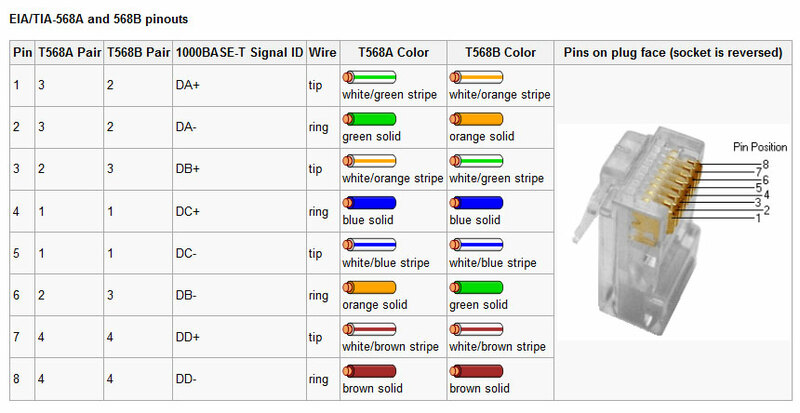 Some small automation software programs use pins 10,11,12,13 and 15 for closure information and pins 1, 14, 16, and 17 for output switching, machine starts and the like. PS2 mouse and keyboard connectors, again, replaced by USB but still found on older motherboards. RJ-45 to balanced audio. 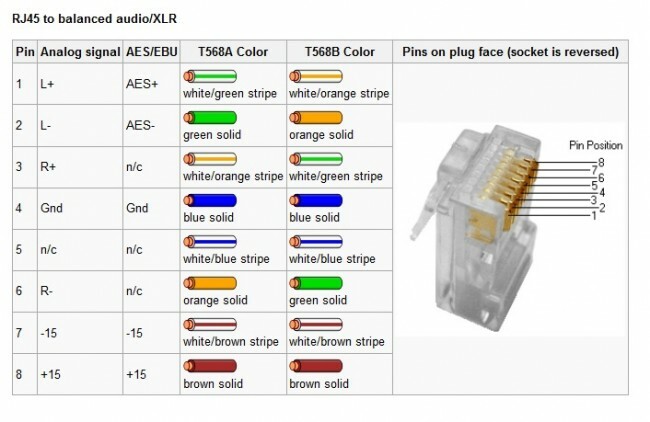 This is a fairly standardized audio application for RJ-45 connectors developed by Radio Systems/Studio Hub. It is also used by Telos/Axia and Wheatstone, although often the +/- 15 VDC power is not included. The ubiquitous XLR connector, still used for analog audio and also AES/EBU digital audio.